Well what can we say about the Ancho? It's grown everywhere in Mexico and is delicious. Ancho Chillies are the dried form of the Poblano Chilli. They are very dark red, almost black and when fresh they look like a large sweet pepper with dark patches. 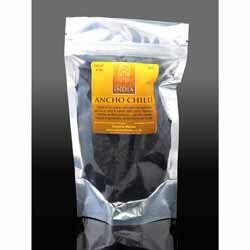 Ancho chillies are mild and sweet with berry flavours. They are very versatile and can be stuffed (relleno), cut into strips (rajas) or used to add interest to most dishes. Ancho chillies are one of the "holy trinity" (together with the Mulato and Pasilla) used to make many of the traditional mole sauces. Rehydrate in warm water for 20 minutes before use. Store in a dark, cool & dry place.